LG Roadshow attendees discover a myriad of industry solutions. 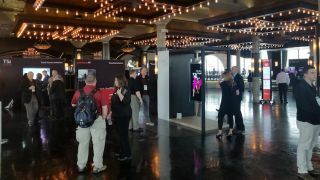 The LG Roadshow made its last stop in Houston, TX last week; the roadshows are a way for #AVTweeps to get up close and hands-on with LG’s latest and greatest commercial display innovations and certified partner technologies. The focus of this event was clearly more than displays; it was plain to see that LG was all about the full technological ecosystem. At this event, there were two new partners involved, one of which was Datapath. “We do nothing without great displays, we are the processors,” said Eric Wooten, the company’s Midwest U.S. senior sales manager. Datapath had its new iolite 600 controller with WallControl 10 software on display. With the software, Wooten said, you can easily and quickly place any piece of information anywhere you’d like. And, in this case, all of that information was placed on an LG display. Along with the company’s displays, LG’s webOS was live and in action at the roadshow. Not just for consumer TVs, webOS is a smart signage, multipurpose platform that can be easily integrated into displays to provide various solutions; it is a web-centric, built-in media player with system on a chip architecture, cutting costs on buying multiple media players in spaces with large amounts of displays deployed, according to Peter Kim, technical product manager, LG. “Eighty percent of the industry won’t need any extra equipment when using webOS,” he said.